Heat the oil in a medium saucepan over medium-high heat. Add the onions and cook until softened, about 5 minutes. Stir in turkey and BBQ sauce and heat through. Mix pre-shredded slaw with Jimmy’s Cole Slaw Dressing. Approx. one bag of slaw to ½ jar of dressing. 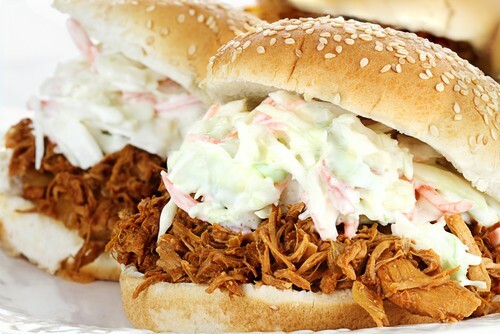 To serve, spoon a 1/4 cup of the turkey onto the bottom half of the rolls, garnish with 2 tablespoons of the coleslaw made with Jimmy’s Cole Slaw Dressing and top with the top half of the roll.